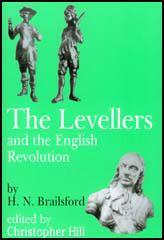 front-cover of a Leveller pamphlet published in 1646. On 1st August, 1648, the House of Commons voted for Lilburne's release. The next day the House of Lords agreed and also remitted the fine imposed two years earlier. 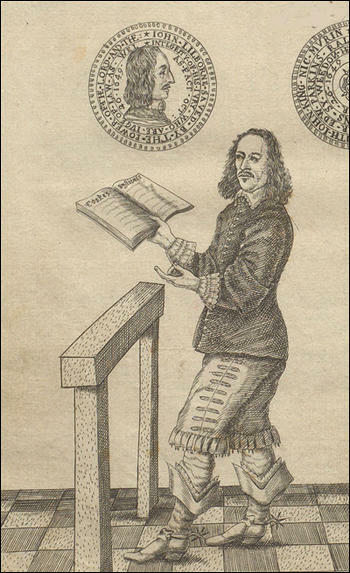 On his release Lilburne became involved in writing and distributing pamphlets on soldiers' rights. He pointed out that even though soldiers were fighting for Parliament, very few of them were allowed to vote for it. Lilburne argued that elections should take place every year. Lilburne, who believed that people were corrupted by power, argued that no members of the House of Commons should be allowed to serve for more than one year at a time. 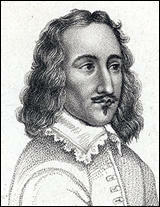 The House of Commons was angry with Thomas Rainsborough for his support of democracy in the Putney Debates and General Thomas Fairfax was called before Parliament to answer for his behaviour. For a time Rainsborough was denied the right to take up his post as Vice Admiral. Eventually, after support from Fairfax, Oliver Cromwell and Henry Ireton, Parliament voted 88 to 66 in favour of him going to sea. 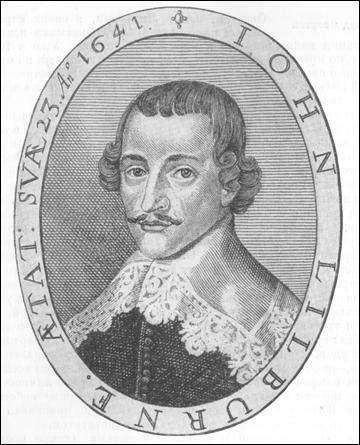 This picture of John Lilburne appeared in a pamphlet published in 1649. Although he agreed with some of the Leveller's policies, including the abolition of the monarchy and the House of Lords, Cromwell refused to increase the number of people who could vote in elections. Lilburne attacked Cromwell's suppression of Roman Catholics in Ireland and Parliament's persecution of Royalists in England and the decision to execute Charles I. Although once again he was found not guilty of treason. Cromwell refused to release him. On 16th March, 1654, Lilburne was transferred to Elizabeth Castle, Guernsey. Colonel Robert Gibbon, the governor of the island, later complained that Lilburne gave him more trouble than "ten cavaliers". In October, 1655, he was moved to Dover Castle. While he was in prison Lilburne continued writing pamphlets including one that explained why he had joined the Quakers. In 1656 Cromwell agreed to release Lilburne. However, his years of struggle with the government had worn him out and on 29th August, 1657, at the age of 43, he died at his home at Eltham. Lilburne's chief purpose when he defied the Star Chamber was to establish a basic civil right - the right of an accused person to refuse to incriminate himself. It was characteristic of the so-called "prerogative courts" that their procedure was based on the examination of the arrested person, who was required to take an oath even before he was charged. The purpose of these courts was to secure a conviction by extracting a confession, rather than building up a case against him on the evidence of others. Wherever confession is regarded as the ideal form of proof which every officer of justice is bent on achieving, not all of them resist the temptation to use illegitimate forms of pressure, ranging from bullying and trickery to physical torture. No man should be punished or persecuted... for preaching or publishing his opinion on religion.... All and every particular and individual man and woman, that ever breathed in the world, are by nature all equal and alike in their power, dignity, authority and majesty, none of them having (by nature) any authority, dominion or magisterial power one over or above another. Every free man of England, poor as well as rich, should have a vote in choosing those that are to make the law. This is the method we have used in London. We have appointed several men in every ward to form a committee... they arrange for the Petition (list of policies supported by the Levellers) to be read at meetings and to take subscriptions. 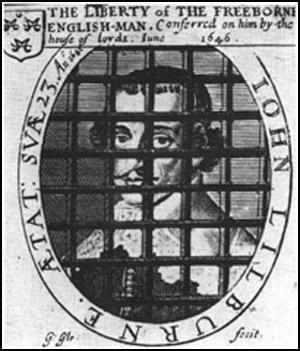 (5) In 1649 John Lilburne wrote a pamphlet attacking the execution of Charles I.
I refused to be one of his (Charles I) judges... they were no better than murders in taking away the King's life even though he was guilty of the crimes he was charged with... it is murder because it was done by a hand that had no authority to do it. That since we are assured of our creation in the image of God, and of an interest in Christ equal unto men, as also of a proportional share in the freedoms of this commonwealth, we cannot but wonder and grieve that we should appear so despicable in your eyes as to be thought unworthy to petition or represent our grievances to this honourable House. Have we not an equal interest with the men of this nation in those liberties and securities contained in the Petition of Right, and other the good laws of the land? Are any of our lives, limbs, liberties, or goods to be taken from us more than from men, but by due process of law and conviction of twelve sworn men of the neighbourhood? And can you imagine us to be so sottish or stupid as not to perceive, or not to be sensible when daily those strong defences of our peace and welfare are broken down and trod underfoot by force and arbitrary power? Would you have us keep at home in our houses, when men of such faithfulness and integrity as the four prisoners (John Lilburne, Richard Overton, William Walwyn, John Wildman), our friends in the Tower, are fetched out of their beds and forced from their houses by soldiers, to the affrighting and undoing of themselves, their wives, children, and families? Are not our husbands, our selves, our daughters and families, by the same rule as liable to the like unjust cruelties as they? Nay, shall such valiant, religious men as Mr. Robert Lockyer be liable to court martial, and to be judged by his adversaries, and most inhumanly shot to death? Shall the blood of war be shed in time of peace? Doth not the word of God expressly condemn it? And are we Christians, and shall we sit still and keep at home, while such men as have borne continual testimony against the injustice of all times and unrighteousness of men, be picked out and be delivered up to the slaughter? And yet must we show no sense of their sufferings, no tenderness of affection, no bowels of compassion, nor bear any testimony against so abominable cruelty and injustice? The Women Petitioners again attended at the door of the House for an answer to their Petition concerning Lilburne and the rest. The House sent them this answer by the Sergeant: 'That the Matter they petitioned about was of an higher concernment than they understood, that the House gave an answer to their husbands, and therefore desired them to go home, and look after their own business, and meddle with their housewifery.